Buzz Books gives you 40 chances to find your next great reads, providing exclusive early looks at the next big thing from favorite authors and hot new discoveries. At the end of most excerpts, you will find a link to the full galley on NetGalley! From bestselling authors we have samples of new work from Barbara Kingsolver, Diane Chamberlain and Jude Devereaux, who breaks away from romance with her first mystery. A rich selection of highly anticipated follow-up books is inside too: Sarah Perry’s Melmoth, a companion to The Essex Serpent; Elizabeth McCracken’s Bowlaway; and Leif Enger’s Virgil Wander. This edition is packed with 16 big debut novels, including the highly-touted The Silent Patient by British screenwriter Alex Michaelides, already being adapted to film and posed to become an international bestseller, and Kathy Wang’s Family Trust, described as The Nest set in Silicon Valley. In nonfiction, bestselling novelist and history author Stephen L. Carter writes about his grandmother in Invisible: The Forgotten Story Of The Black Woman Lawyer Who Took Down America’s Most Powerful Mobster. Journalist Stephanie Land describes her poverty-ridden early years in Maid: Hard Work, Low Pay, And A Mother’s Will To Survive, a Book Expo Buzz Editor’s Panel pick. Memoirs on two opposite ends of the spectrum include My Own Devices by rap singer Dessa and Witness: Lessons From Elie Wiesel’s Classroom by Ariel Burger. Regular readers know that each Buzz Books collection is filled with early looks at titles that will go on to top the bestseller lists and critics' "best of the year" lists. And our comprehensive seasonal preview starts the book off with a curated overview of hundreds of notable books on the way later this year. While Buzz Books feels like your own insider access to book publishing, these collections are meant to be shared, so spread your enthusiasm and "to be read" picks online. For still more great previews, check out our separate Buzz Books 2018: Young Adult Fall/Winter as well. Finally, don’t miss our popular Buzz Books Monthly editions, available on Amazon, iBooks, and NetGalley, for up-to-the-minute monthly publication lists and excerpts. Another fantastic resource for upcoming titles. I've already used a few of the direct links to request titles that look intriguing! Great recommendations for new Fall / Winter releases. Can't wait to read some of the novels mentioned! Another great Buzz Book! I love that I can get a sample of some pretty exciting books so that I can decide which ones to add to my tbr and which ones I plan to feature on my blog. I am really looking forward to checking out Jude Deveraux's first mystery! This collection of 2018 Fall/Winter Buzz Books is *LIT*! The excerpts are served in generous portions. They are larger than appetizer size, and more like a small plate size that leaves you wishing that it came as an entire entree. The samples made me crave so many of the books, and I devoured them like a starving bookworm. The carefully curated selections are offerings for audiences and genres in all shapes and sizes. I am especially looking forward to The Silent Patient by Alex Michaelides, Family Trust by Kathy Wang, The 7 ½ Deaths of Evelyn Hardcastle by Stuart Turton, Cross Her Heart by Sarah Pinborough, Lies by T.M Logan, Leave No Trace by Mindy Mejia, and Liane Moriarty’s new book. The Fall/Winter 2018 Publishing Preview list also tempts you with tantalizing titles and leaves you interested in many more upcoming books. Thank you for this great edition! Just as we are planning our beach reads for the summer, along comes Buzz Books 2018: Fall/Winter by Publishers Lunch to entice us with fall and winter titles. A great number of excerpts are found here: 20 fiction titles, 16 debut fiction titles and 4 nonfiction titles. Also, the fall/winter publishing preview lists hundreds of titles with publication dates sorted in 4 categories: fiction, debut fiction, commercial fiction and nonfiction. This is a great tool for anyone interested in the world of books. Thank you so much for making this available. There are lots of good books coming out in the fall and winte. Thank you NetGalley for letting me read this for an honest review. I admit I had no idea books like that existed and I LOVE IT! So many books, so many authors, some I already knew, new ones...   At the end of every sample you can find a few lines about the author. I like getting to know the author, where they're coming from... And more info : ebook price, publication date... everything you need to know! I love reading summaries and samples of books then want to read them all! I'm not kidding, they all look so good to me! And you find different categories, different types. I will read other buzz books for sure, it's that good! When you're a book addict, you just want to read everything, especially when they look interesting! Thank you! I now have a new list of all the books I want to read! I loved reading the excerpts of several of the books and my TBR list grew exponentially. I've already requested several of the novels. I'm excited for these books to come out into the world to discuss with other readers. My TBR list takes a hit again! I love these previews of upcoming releases - not only are there some great books, but the collection is always a reliable predictor of the upcoming trends in fiction. Stellar as always! I've spent my evening going through the most recent Buzz Books, and this one in particular blew my reading stack to oblivion. At this point, I'll never dig my way out, but if you're going to be buried, under a pile of books seems most desirable, am I right? Without this edition, I might not know about Eli Weisel's biography coming out! Now I have it to read, and I couldn't be more thrilled (Eli Weisel, people!!!). And as usual, the excerpts were so helpful in guiding me towards the books that would be a good fit for me. Thanks again, Buzz Books! Holy cow!! Fall and winter can't get here fast enough! There are so many awesome books coming out then! I requested way too many from here and then wrote the rest down to look for later! What a great way to get a taste of what is coming up in books! Run and grab this wonderful collection of new books you are going to want to request just like me! Always happy to receive the preview. Fantastic insight to what's on the way - some old favourites and some exciting debuts. Thanks! I love these previews! I always look forward to reading excerpts from upcoming novels and never fail to find a few I've never heard of but fully intend to add to my TBR! This is the most buzzy of buzzes! This publication is available through NetGalley or you can access it at Amazon. It is absolutely worth looking at. Among the exciting things to mention for the fall season ...Jodi Picoult, Tana French, Barbara Kingsolver and Kate Atkinson all have novels coming out. They and so many others are listed in this Book Buzz. It will be a great season for reading! This is wonderful for staying on top of what’s coming in the future months. It helps create an interest in what is coming in fall/winter. I cannot say enough good things about this series! It is a fantastic way to get a feel for what books to choose to read and review! this is a terrific compilation of upcoming books! Love the easy to use links to request ARCs. Thanks! As always, thank you for allowing me to glimpse the books for next fall/winter. I always appreciate seeing what my favorite authors are writing and the new authors to watch for. I just love the Buzz Books collections. I'm able to read just enough of a book to know if it is one I will want to get my hands on or one I can pass on. They are great way to add to my always growing TBR piles. This is my first buzz book and I like all the peeks at different books coming out! I am excited to check out Lies by TM Logan and Sarah Pinborough's upcoming book! Great selection of books! I enjoy finding about the debut authors especially as they can sometimes get lost in the midst of new releases. Nice length for the excepts too, not so long that you feel like you’ve read the whole book but long enough to decide if you would like to know more. I love the Buzz Books previews since they give me a great idea of books I may want to review, or have reviewed, in a later season. It's great to have fairly lengthy excerpts of a few chapters to get an idea of the author's writing style and what the book is about. Thanks for listing the publicist's name and email at the end of each. As a librarian who selects popular materials, I'm also appreciative of the opportunity to preview the books our patrons will be asking about in the fall. This was quite a comprehensive preview of many amazing novels that I look forward to researching, sharing, and reading. If you are an avid reader, this guide will help you select many diverse new books to add to your reading list. Great intro to upcoming books. Look forward to reading them. 2018 is shaping up to be one of the best book years in a while. This is not a complete list, but will give you an idea of some of the books to be published sometime before the end of this year. I’ve tried to include a variety in each category, enough to give you an idea, but there are many more. For some of the books to be published in the Fall / Winter of 2018, there are brief excerpts included – similar to what you would get if you had a kindle “sample” of a book. I could not get over the amount of books previewed in this book. So many great books to look forward to reading! Definitely helping me get my TBR titles together! I highly recommend! Buzz Books 2018 has 2 components - each of which make it invaluable, perhaps for different audiences, but I'm sure the Venn diagram of readers interested in both shows a significant cross-section of readers. The first component of Buzz Books 2018 is a fall-winter publishing preview, with release dates, of: (a) certain literary fiction, with sublists for "highly anticipated" and emerging voices, (b) debut fiction, (c) commercial fiction, and (d) certain nonfiction, with sublists for politics & current events, social issues, science and technology, history and crime, essays criticism and more,  As someone who follows most anticipated lists closely, I still augmented my TBR by at least ten titles I hadn't known were scheduled for 2018 release, thanks to this publication. No, it's not a comprehensive list of all pubs, but it is broad and deep, nonetheless. 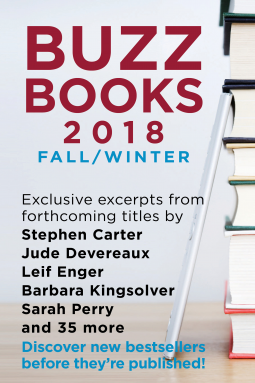 Second, Buzz Books 2018 (Fall & Winter) includes excerpts from a range of anticipated publications, including the following: Arikawa's The Travelling Cat Chronicles, Deveraux's A Willing Murder, Kingsolver's Unsheltered (my favorite), Mosley's John Woman, Adjei-Brenyah's Friday Black, Kochai's 99 Nights in Logar, and Carter's Invisible: The Forgotten Story of the Black, Woman Lawyer Who Took Down America's Most Powerful Mobster. Read what interests you; skip those that don't. In any event, Buzz Books 2018 (Fall and Winter) is worth perusing for all readers interested in upcoming releases. I really appreciate these reviews. They help me filter my requests and result in more successful, targeted reading! Thank you for an ARC of this  Buzz Book in return for my honest review . I have been trying not to add anything else to my reading wish list on NetGalley but this Buzzbook just ruined that notion entirely! I highly recommend this read as a great sampler of soon to be realised books covering a number of genres. I am very excited by a number of the excerpts and very grateful for the samples of each book provided . I can’t wait to start reading some of these and to see the next seasons Buzzboosks. Great collection of upcoming fiction and non fiction books. Plenty of new books for me to explore in the future. As always, I enjoyed reading this quarterly installment of Buzz Books. There are so many good books coming this Fall/Winter that I am keen to read. I hope that these magazines continue getting published. So helpful. Wow. Lots of reading here. I've been reading most of the afternoon and though I got through quite a few of the excerpts (the ones I thought would appeal to me), I'm not even halfway through! Being in the UK some of them might not be available to me (at an affordable cost) when they are published but there are a few I will look out for. I've enjoyed a few Diane Chamberlain books in the past and I'm sure The Dream Daughter will be on my list. I was intrigued by Daughter of a Daughter of a Queen but I'm not sure when or if that will be published in the UK. I do hope it will be. I think I would also like to read The Boy at the Keyhole. I'll need to look out for news of that one. I don't often read short stories but there was something about the Friday Black excerpt that made me want to read more despite the fact it is a kind of horrific tale.of consumerism at it's worst. No doubt over the next week I'll find many more titles to look out for. Thank you. Thank you so much for posting these to look through. It introduces me to books I may not pick up before and gives me a chance to get a taste for what's to come later this year. It gets me so excited! I wouldn't have known about these otherwise. So many book recommendations, so little time! But I will make time. Can’t wait to pick out the ones to read. Another release full of great excepts and information. You honestly cannot go wrong giving this a read. I love being able to use the excerpts to decide whether to pursue a book in the future as you don't always know from the synopsis alone. Genuinely, a resource I would miss were it to stop! Thank you for making this available. It's a great resource when trying to decide which galleys to download for the coming months. There are going to be a lot of good releases this upcoming fall/winter 2018, in the realm of both fiction and nonfiction. I am especially excited for several, including Hiro Arikawa's The Travelling Cat Chronicles (which looks to be both sweet and heartbreaking), Sarah Bird's Daughter of a Daughter of a Queen (which was already on my TBR list), Stuart Turton's The 7 1/2 Deaths of Evelyn Hardcastle (which looks to be thrilling and exciting). Can't wait to read these titles - and more! Best place available to preview new Fall/Winter titles. Thanks to Publishers Lunch for making this available. It is invaluable to me as a bookseller. Thanks to Netgalley for an eARC of this book. There are so many books that are coming out soon that I am looking forward to reading! I can't wait for these to be released. A good resource  to find out about upcoming books in the fall / winter. Lots to look forward to add to my TBR list abs to request for . An excellent assortment of new books in this edition. There is something for everyone in this edition of the Fall/Winter book. Always find this seasonal preview helpful! Really enjoyed this group of excerpts. Thank you for providing. These books are always great for reading up on the next new and notable titles. They always help me find new titles to add to my TBR and/or request for review for my blog. I love gettting these Buzz Books. I usually only want it for a peek at a title or two. But then I end up discovering a few more titles to read. The star of this edition is clearly Melmoth from Sarah Perry. But the new Elizabeth McCracken looks amazing. This is my first time getting a Buzz Book and I feel like a kid in a candy store! I can start getting a taste of the Fall/Winter books and the excerpts are conveniently linked to easily request NetGalley. Love the excerpts and overview of what's coming up in the Fall/Winter. Buzz Books is a fantastic resource when sorting out what to request for reviewing. I always enjoy these sneak peeks at what is coming up as I always find something that interest me. I will definitely be watching out for some of these especially the thriller/mystery ones! I found the fall/winter Book Buzz extremely helpful. I am not going to be traveling to NY for bookcon this year, so this was helpful to see what is coming out later this year. Not the whole books, or ARCs by any means, it still gave me an idea of the books I will be wanting to purchase this fall and winter. Now it is the wait that is going to kill me! The majority of the books I read currently are from the young adult category, so this gave me the opportunity to reach out of my comfort zone a bit. It introduced me to several new authors and has me looking forward to reading books from genres previously would have never considered. This is the first time I downloaded one of these guides. I was able to put a lot on my TBR shelf. I will most certainly use additional guides in the future. My to-be-read list just got longer! Another great Buzz Books. Not to be missed! Thanks to publisher and Netgalley for the chance to read this book. While I got the book for free, it had no bearing on the rating I gave it. I enjoy reading these preview books. It's a good peek into what is coming later this year. I'm really excited to read The Travelling Cat Chronicles. This is the first time i have known about and received Buzz books. The Fall/Winter edition of upcoming books is a valuable resource and have already preordered several based on their  previews. My To Be Read list list is getting longer. I absolutely love these Buzz book teasers. It always puffs up to TBR list and the samplers included are good enough to give you a taste of an author’s writing style and make you take a chance on a writer you may have otherwise ignored. So I hope they never stop with these and here is what I’m adding to my list for Fall/Winter. John Woman by Walter Mosley and My Mother, Barack Obama, Donald Trump And The Last Stand of the Angry White Man: An Autobiography of America. Both were outstanding! Pub date for both is Sept. 4. The book I'm most anticipating is Michelle Obama. And I'm eager to see how Carol Anderson follows up on White Rage with her new offering. It's always a good day when I see a Buzz Books pop up in the feed! Love checking out all of the sneak peeks in this guide! An exciting array of novels and nonfiction titles are slated for the 2018 Fall/Winter season. Among the stories I look forward to sharing with co-workers, friends, and library patrons include Mark Dery's new biography of celebrated illustrator Edward Gorey; Michelle Obama's memoir, Becoming; an English translation of The Travelling Cat Chronicles by Hiro Arikawa; and the Civil War drama, Daughter of a Daughter of a Queen by Sarah Bird. I'm also intrigued to see how Jude Deveraux, bestselling romance novelist, fares with her first mystery, A Willing Murder. Examinations of the American political landscape continue to provide much food for thought. Neil deGrasse Tyson and Avis Lang partner in an exploration of the ties that bind astrophysics and the military. Between follow-ups to previous releases, debut authors, and the range of nonfiction, you won't have much time for anything else. What a wonderful "problem" to have. I always love getting a preview of upcoming reads! Enjoyed knowing that many of my favorite authors will have new material in fall and enjoyed perusing the many excerpts provided in this book! Thank you so much Net Galley for sending me a copy of this book for my honest review. This was the first time I’ve had a book of this type and it was awesome! Being an avid reader, I truly enjoyed getting a heads-up of new books and authors for the fall/winter of 2018. I marked many books for TBR, and took advantage of the links offered on several of the books. I highly recommend that all readers that like to see what’s coming on the horizon get this book and enjoy the short excerpts of each of the books to see what you like,. ALso included is a bit of information about the authors, which is also interesting. Enjoy! Thank you Net Galley for sharing this one. I appreciate the  heads-up about all new books and authors for the fall/winter  2018. It helped me develop a reading list. marked many books for TBR, and took advantage of the links offered on several of the books. The excerpts help determine what’s really interesting. books to see what you like,. The author information was a nice touch too. Thanks again. So look forward to this edition! Thanks so much to Publishers Launch once again. I really enjoy reading every issue of Buzz Books because every time I find many interesting books to add to my TBR. In this edition of Buzz Books 2018 : Fall/ Winter I discovered books that I had heard and after reading an excerpt from it I added it immediately to my TBR. I also found books that I didn't know but I look forward to learn more about them and read them. I love the Buzz Books Monthly books. The excerpts are just enough to place the books on the to-be-read list, or not. Thank you for these!! Fall is usually “big”  book season and this year is no exception. There are familiar and well-loved authors coming out with new books, but there are also intriguing books by debut authors. The lengthy book excerpts along with the list of upcoming titles that Buzz Books provide are a great resource for planning, reading, and reviewing upcoming books. A great preview and lots of books to be excited about! A useful book for someone looking to get a head start on things to read for the upcoming half of the year. I personally only a found a few standouts for me but I believe that reflects more on my tastes and less on the quality of the stories found within. I'll continue to look in the future for more Buzz Books so I can get a leg up on finding new stories to read. As always, I love the Buzz Books previews and excerpts! Excited to see many of these reads coming this fall! With over 100 featured titles and 40 excerpts of the season's most anticipated novels,  Publisher's Lunch is the professional reader's go-to-guide for great books. Each quarterly edition is divided into three sections: Fiction, Nonfiction and Debut and organized alphabetically to make it easier for readers to find their next great read. I absolutely LOVE getting the Buzz Books magazine. It gives me an opportunity to plan out my next ARC requests! As always this is a fabulous book to get a head start on your reading list. So many alluring.books and a great way to learn about what's new from your favourite authors. I love being able to read excerpts and request the egalley. I love love love Buzz Books and will continue reading it years to come! Thank you so much for providing a free ecopy. I highly recommend. The Publishers Lunch Buzz Books are always fun. There's fiction from several genres as well as non-fiction. Each excerpt has a good summary of the work and some background information about the author to give a fair idea of whether or not this might interest you. This edition is for books due to be published roughly between September 2018 and February 2019 (the dates I remember seeing - I haven't checked each one). If the books are available on NetGalley for review, there is a direct link to click to request the book from a Kindle. There are many Buzz Books publications for various seasons, genres, months - and they're all Read Now on NetGalley or on the Publishers Lunch website. This snippets and previews are really great for finding out the new titles and what books are good to recommend for customers, especially those looking for reader's advisory, or those who like the newest titles. Great review of upcoming titles for Fall/Winter 2018. It's great to be able to get a handle on what to look for later this year. I'm excited for a lot of the upcoming titles. I loved the book. So many exciting new books coming out. It helped me to figure out what to add to my MUST read list. Plus the teasers were just long enough to give you a good feel for what the writing will be like and whether you want the rest. Always good to get a preview of some of the upcoming titles, and I appreciate the extracts which give a feel for the writing style. Thanks. Loved this preview of exciting Fall/Winter 2018 titles! Definitely found some new to me titles to add to my TBR list that I wouldn't have considered otherwise. These preview samplers are extremely helpful, allowing me to identify books of interest and books that aren’t a good fit. I’m glad I’ve discovered them! I'm always impressed by these collections, but this particular one was amazing! So many interesting books to look forward to, I can hardly wait. I had never seen a Buzz Book catalogue prior to this and for a book lover, it was amazing. I am excited to get a preview of some much anticipated titles that will be released this year and can add them to my wish list. An excellent resource for book lovers and reviewers. I was able to discover both promising titles to be released from favorite authors as well as discover new authors that piqued my interest. I will definitely return again and again to Buzz Books for sneak peaks of new books in the future. What a tantalizing and tempting compendium of the pick of new titles for late 2018. With descriptions and a generous extract chapter of each book, plus a link to request most of them here on Netgalley there's enough material here to tease your taste buds for hours. There's a great cross section from established authors and some great sounding debut novels as well as a smattering of non fiction. This is the essential companion for book lovers everywhere. I can't thank Buzz Books enough for making this book. The categorization is so meticulously done. Excerpts are the best part of the book. The non-fiction book lovers will especially find this book to be helpful. It is good to see the debut works also had a place in the book. These Buzz Books Previews are great! I loved getting to read these samples and already requested several books I'm excited about! Thank you so much for making these excerpts available! They are so helpful in choosing books to request, especially if I am a bit unsure after reading the book description. Once I am able to read an actual excerpt from the book it is much easier to tell if it will be a good read for me to request/review, so I really appreciate these Buzz Books collections!. This was my first Buzz Books! Worth it! Loved the previews and have my list of books to request now. Convenient, easy, and fun! I ALWAYS look forward to seeing a new "Buzz Books" offering. Looks like a great season ahead and have added so many of these to my 'To Read' list! Thank you! I loved this collection of book excerpts and reviews for up and coming books. I loved the previous Buzz Books collections, and once again this one had me scoping out a bunch of new books, and adding them all to my TBR. I am most excited for Lies, The Travelling Cat Chronicles, and Freefall. A huge thank you to NetGalley for sending me a digital copy of these book previews in exchange for an honest review. I truly appreciate it! Buzz Books 2018: Fall/Winter is a great resource for reviewers and readers looking for their next great read! Containing Publishers Lunch’s guesses for the most popular books in the coming months, this book is an invaluable asset for bloggers, reviewers, booksellers and librarians. This is my first look at a Buzz Books and I can’t believe what I missed. This issue contains 20 fiction, 16 debuts and 4 non-fiction books. Each contains a short summary, an excerpt and publishing information with a link on most to request the book on NetGalley. I enjoyed the opportunity to preview books outside my usual genres. I requested 2 books and wished for 1 on NetGalley. I downloaded 1 for a publisher for which I am autoapproved. I also requested 1 on Edelweiss that wasn’t available on NetGalley. Overall, I spent a pleasant evening finding books. The only downside is my TBR pile is digitally overflowing from my bookshelf to the floor—but that’s a good thing, right? 5 stars! Thanks to Publishers Lunch and NetGalley for a copy. There are lots of great books to look forward to coming out in in the fall/winter! I am most looking forward to The Shadows We Hide by Allen Eskens. I am also looking forward to Sea Prayer by Khaled Hosseini, Unsheltered by Barbara Kingsolver, Good Riddance by Elinor Lipman, We Are That Young by Preti Taneja, Look Alive Twenty-Five by Janet Evanovich, We Fed an Island by Jose Andres, and Lab Rats: How Silicon Valley Made Work Miserable for the Rest of Us by Dan Lyons. I will also be picking up the new books from favorite authors such as John Grisham, Elin Hilderbrand, Anthony Horowitz, and Liane Moriarty. I always look forward to these Buzz Books! Super helpful, as always! I've come to rely on the BuzzBook publications to help make customer recommendations. By browsing the excepts in this compilation I found several books that I want to read in genres I do not usually read..
What a fantastic preview of books for the fall and winter. Adding a dozen or so to my must read list. This is an excellent source of information for fellow bookworms that like to be in the know. It's nice to see something from The seasonal 'Buzz Books' are always good for seeing what's upcoming! This edition has 40 excerpts including 16 big debut novels. I was interested to read something from Sarah Perry. Looking forward to hearing how each of these are received once released. Love these Buzz compilations of books as a great way to find titles to add to a collection, to my TBR pile, and to talk up with patrons and colleagues. Having a brief selection from each title is so helpful, since sometimes covers and blurbs don't really capture the true flavor of the book. Also, these are a great way to find new authors to read. An amazing collection of new upcoming releases with excerpts from every title. I can honestly say that my TBR just got a bit longer. Loved this book! It helped me find so many more titles that I want to read and I'm excited for the fall/winter! Fantastic resource to get a glimpse at the upcoming titles- with release information, summaries and some sample excerpts that make readers/reviewers excited to eagerly await their publication. A fantastic resource to have has a blogger who likes to know the newest and exciting upcoming reads . A great way to discover hidden little gems that I might not otherwise hear about. Buzz Books 2018 Fall/Winter a great preview at what is in the coming months. A great way to check out new to you authors, get excerpts on some books plus which publisher and lots more on books. As usual the 'Buzz Books" add an inordinate number of books to my TBR. I am looking forward to reading several of the books written by those who look like me. This curated selection was priceless - Sarah Bird and Walter Mosley. Even more excited to read several of the US-based psychological thrillers and debut novels. This is a great book for those looking for new authors. Better still, it is a great way to sample the books! I really like this! Is there one available for middle grade and children’s literature? So awesome to see what is coming out and read an excerpt. Lots of promising reads for the Fall and Winter. Look forward to getting my hands on the majority of these books to read in their entirety. This is the first time I have looked and read these Buzz Books. I must say this is amazing and will continue to download these  to keep in the loop. This will keep me prepared for my reading and requests here on #NetGalley. I love that I have a chance to read samples of great books that are yet to come! Great idea! A really useful and well-produced guide on the best up and coming books with that all-important excerpt. Beware - make sure you go through the whole thing before you start making requests, otherwise, you might find yourself swamped in books and struggling to choose what to read next! Thanks to Publishers Lunch and NetGalley for providing a copy of this book in exchange for an honest review. Greatly assembled sampler. Several of the books selected to be in this one caught my eyes earlier this year. Reading the excerpts here is a great way to get to know a little more about them. Will be keeping an eye on The Silent Patient. Soooooo many great authors! Loved being able to add so many great titles to my wish list for the cold winter months! Fabulous resource for book-a-holics like me! This is my go to when I am compiling my list of what to read in the fall and winter. I love the excerpts from the new titles as well as the lists enclosed. What a spectacular edition of Book Buzz by Publishers Launch. It is for the Fall/Winter edition. There are way too many books, good books at that, it is impossible to list them all here. Trying to go through the samples, one by one, would also take forever to discuss in this forum. Be assured that you will want to go through this book page by page, unless you don't want to add any books to your "To Be Read" list. Yes, mine increased dramatically. I just couldn't resist. Some of them were by well known authors like Michael Connelly, Sarah Pinborough, Jodi Picoult, Walter Mosley, Joe Ide, Khaled Hosseini, Anne Rice and Neil deGrasse Tyson just to name a few. There are a bunch of new authors are making their debut that look very exciting. There is a whole slew of non fiction political books that I personally will pass on but if that's your jam, there is lots of choice. The rest of the non fiction selections are varied and look so interesting. The book excerpts really introduced me to books that weren't on my radar, from authors I wasn't familiar with. Of course, some I already had on my TBR list but getting to read a bit is like having one square of chocolate. Can't wait to eat the whole bar! With the ones I wasn't familiar with I had a chance to get a sense of the author's writing style,  a better feel as to whether or not I would enjoy the novel and too many of them were too good to pass up on. This will be an exciting fall/winter season if this is but a selection of what is being offered. Thank you to Netgalley and Publishers Launch for a free copy in exchange for an honest review. The treasure everyone wants and should want if they're a serious reader or just love books. We wait for this little charmer every year: Buzz Books 2018: Fall/Winter when the mother-lode of the best books are published! Read the list of the Fiction and Non-Fiction Books (by category) to be released this Fall with approximately 23 Excerpts of fiction and nonfiction titles, including debut authors as well as many favorites. Plus, many have links directly to NetGalley to request an ARC. What could be easier? You're right, nothing. Request your's today! A new collection of excerpts from Publishers Launch that I thoroughly enjoyed reading. I am curious about a few of these books, so I'll keep an eye out for them. How fabulous! This is the first Buzz Books edition I have looked at and I am disappointed I did not do so sooner. It's much longer than I imagined, allowing for plenty of information about many books across genres. I've already earmarked some books that I'll be adding to my 'to read' list, and I'm sure there will be more additions to the ever-growing list once I have time to go through the entire edition. A really helpful compilation of interesting Fall/Winter releases! I always find new books to add to my tbr. Fantastic selection, covering a breadth of genres, authors, and styles. A great way to hone one's anticipation. Due to unexpected circumstances, I was unable to finish this selection. Thank you to Netgalley for the opportunity. A very helpful compilation of upcoming bestsellers. I appreciate the Buzz Books collections, as they make it easier for librarians and booksellers to get a taste of what's coming soon. This is a very informative book. I like how it is organized, however, for visual people it would helpful to see the cover of the book. Love this! Thank you for the sneak peek into what’s coming out this Fall/Winter. Lots to look forward to! This is a fun, great way to preview upcoming books - a chapter or so of each anticipated book is shared - the range is lovely and diverse - something for everyone. Some genres I’m not into and while i didn’t end up going past a couple of paras of a few, I appreciated the opportunity to sample. There were some good ones and debut authors as well - always great to see new writers being published. Three in particular I’m eager to check out - Paris Echo by Sebastian Faulks, The Air You Breathe by Frances de Pontes Peebles and The Traveling Cat Chronicles by Hiro Arikawa, Thanks NetGalley and all the publishers for providing a much-anticipated window into fall/winter 2018. A fun, interesting read! I love that you get a few chapters in some of the upcoming books to preview, especially from favorite authors. Looking forward to some of these titles coming out in the Fall. What a great way to sample many new to me writers. I think this is a perfect delivery method to open readers to many authors. I found the stories interesting, well written and worth my time. Thank-you for offering samples of over 40 books/stories. I was able to sift through and pick out a few new authors for me. Looking forward to reading the entire work they offer. I look forward to Diane Chamberlain's The Dream Daughter; Jude Deveraux's A Willing Murder;  Barbara Kingsolver's Unsheltered , and many more. This is a particularly generous set of excerpts, covering a wide range of topics and styles. A little bit of something for everyone and well worth a look. Love this fabulous wealth of information. It’s such an informative and necessary resource. Can’t wait to read some of these promising upcoming books. I am particularly interested in Chamberlain’s Dream Daughter, Kingsolver’s Unsheltered, and Lee Child’s Past Tense. Buzz Books 2018: Fall/Winter edition has so many books to get excited about. This provides a quick way to gain access to books coming out later this year. There are easy links provided to request books you may be interested in reading. Need a good book to read? Going on vacation and want to hit up a bookstore for your next great read while on the beach? Then you need this book! Buzz Books gives you 40 short narratives on the next bestsellers out (or about to be out) on the market! Buzz Books also gives a curated list of hundreds of books that will be at the top of reading lists all over the world, if they haven't been there already. The lists are broken down into several types of fiction and nonfiction. The books are also from all around the world, not just America, so you will be able to read translated narratives from best sellers from other countries as well. This book is a reader's best friend and navigation expert! My TBR list just got longer! I love having the opportunity to read excerpts and descriptions of upcoming books. There are so many that I may not have heard of had I not read Buzz Books! Thank you! As always, this provides the best of the best as to what we should all look forward to in  Fall/Winter releases for this year. It's always great to get reading samples of books from those that sound appealing or new books from favorite writers to test the waters. Buzz Books is a great selection tool. I appreciate the great roundup of forthcoming titles. I got many ideas for potential book club selections. I added many titles featured here to the library's collection. I love having these previews to get me excited for what's to come. Thanks for putting them out there. Buzz Books covers everything in the publishing world from teen fiction to mass market and to non fiction. If you're  a professional in the book industry, there's nothing else like it to plan ahead. This book was very helpful in pointing me to upcoming publications of interest. Thank you for granting my request to read it. I don't have a patron-facing review to share, since the book served a professional purpose for me. Again, thank you for fulfilling my request. The book is quite helpful. I read each edition as soon as I can so I don't miss anything. I love what an amazing resource Buzz Books are, thank you for producing them! Another fantastic edition of Buzz Books! There is no question that this is my favorite way to discover new releases. I have discovered so many great reads that wouldn't have even been on my radar if it wasn't for this! It always is a pleasure to see what’s coming out soon. Thank you for providing this valuable service for libraries,book sellers and reviewers. It is always difficult to find new titles to request. This is a concise listing that is very helpful. I adore using this publication for building my Fall TBR to share on my bookstagram account! I request some of the books from NetGalley and put the rest on my library and purchase lists. Was great to get an insight into what Publishers Lunch thinks are some of the most exciting, potential best-selling, books of the latter half of 2018! These Buzz Books provide a great opportunity to check out upcoming books! Thank you for the opportunity to see that great books are coming. I always jump at the opportunity to download the latest Buzz Books. The Fall/Winter 2018 edition comes packed with interesting selections. I was already looking forward to Sara Perry's "Melmoth", and there is also an excerpt for the upcoming Barbara Kingsolver novel. My greatest discovery from this edition was "The Traveling Cat Chronicles" by Hiro Arikawa; it is a first-person account from the point of view of a cat and as soon as I was done reading the excerpt, I requested the galley because I loved its originality! What a wonderful resource! So many good books coming up this fall. Easy to flip through, with samples for those titles that interest you. I will be sure to look for these in the future! The Fall/Winter 2018 edition of Buzz Books has helped put several yet-to-be-released books on my radar. So many great previews on a variety of genres! I gravitated to Literary Fiction, so I was thrilled to read selections from a few favourite authors. Barbara Kingsolver's Unsheltered will be awesome, and I enjoyed a peak into Sarah Perry's sophomore novel, Melmoth. There are several solid short stories collections to look forward to, including True Love and Other Dreams of Miraculous Escape as well as Friday Black. A few thrillers also peaked my interest., especially Freefall by Jessica Barry. While I did skip over previews of several romance novels (not my thing), there is a large sample for fans of the genre. I recommend reading this selection if you love to discover new authors and great upcoming reads. In addition to a snippet of the book, there is also an synopsis, author bio, and publisher contact. As always, reading the passages provided here give me an excellent notion of what I would like to read when the weather gets cold. An additional feature I would love to see is a list letting me know which of these will be made on Net Galley. Thank you, Net Galley and Publisher's Lunch, for the chance to read and review. This is always something I look forward to getting. My reading list always multiplies over and over again. I think this time around I saw 50+ titles I absolutely need to read. These volumes are an invaluable tool in wading through the publishing world. I have found the best books when I use Buzz Books. I really appreciate this source! Useful resource for researching which books you would like to request! This title provides information and excerpts on upcoming titles for NetGalley. Will help you make more informed requests and read samples of titles you are on-the-fence about requesting. I always enjoy these buzz books. It's exciting to read what's going to be published in the coming months and get an inside scoop. Keep these books on offer. Have not had a chance to go through this amazingly thorough compilation, but from the few books I read about i’ve Already selected a new book to read that i’m Very excited about. I cannot wait to further sort through the rest of the Buzz Books! This preview of upcoming books is always a great way for me to add to my Reading List, but also feel out some books that I think I'm interested in as well. Keep a pen and paper handy as you review, because you're sure to fine some winners! Another great resource from NetGalley! Thanks for keeping me updated of the latest happenings of my favorite authors, AND some exciting new authors! More to be read! Thanks! Loved the sneak previews of the books in this! I am a huge fan of learning about new titles that will be coming in the future! What a fabulous book! It not only gives the authors’ names and titles, it states date of publication so you can plan on grabbing your favorites when they are published. Even better are the excerpts from books included in this preview type book. I have read most of the excerpts thus introducing me to new authors. There is fiction, non-fiction, debut authors and I have already noted several books I plan to get. Why didn’t I know about Buzz Books before?! Invaluable for the avid reader and will serve as a good reference for upcoming publications with my favorite authors. Lies by T.M. Logan. It sounds intriguing. “What if your whole life was based on lies…..” Perfect life, perfect wife then in one shattering moment you discover nothing is as it seems. The excerpt had me reeled in immediately. Freefall by Jessica Barry is another one that had me completely absorbed. I wish the excerpt was longer, I may have to buy it immediately. This one involves a plane crash and how our main character will try and survive. It starts off fast paced and I can’t wait to get it. The Red Address Book by Sofia Lundberg will be a sad tale. An old women of 96 years will recount her life using her treasured red address book. It was a gift from her father and holds her contacts and stories from her life. Now she will document her life for her great niece Jenny. I think this one will be very good. Since I was a surprise baby for my parents I grew up around much older people. I’ve always loved listening to  ancient relatives tell about their lives. That’s how I ended up researching family history because they had such interesting stories to tell; they lived in times I only read about. Elderly people are too often dismissed in my opinion but they have wonderful stories and memories. The Boy at the Keyhole by Stephen Giles sounds like a Rebecca type novel. Nine-year old Samuel lives alone at a once great estate in Surrey with his family’s housekeeper, Ruth. His father is dead and his mother has been abroad for five months, purportedly tending to her late husband’s faltering business. Samuel only receives postcards from her and maps put her travels in an atlas, but he clearly wants her to come home. From the excerpt I can’t decide if Ruth is good or not. Looks like a good mystery. There are many more books that piqued my interest but that was a quick highlight. In the future I will most certainly look for a copy of Buzz Books so I can plan my reading. Thank you to NetGalley for providing me with a complimentary copy. My enthusiastic opinions are my own and I was not compensated for this review. I really love having the opportunity to read little snippets from popular books that I am highly anticipating! I love these Buzz Books collections. It's so exciting to sample all these upcoming books, and being able to read them all in one anthology-type volume is really helpful. As usual, I've found several new books I want to read and a couple I'm thinking of buying as gifts. Thanks so much for continuing to provide these wonderful compilations! Great recommendations! I really love to read the excerpts from BuzzBooks!! It's very helpful to have a list of books that will be published in the following months so I can decide which books to request on NetGalley. Buzzbook gives you excepts/summaries of the  most anticipated/talked about books coming up for the Fall of 2018. You’ll find an introduction about the book, the book cover, info about the author … some include a sample reading. The list can be found at  http://buzz.publishersmarketplace.com/ or on Amazon free on Kindle. Thanks to the publisher for the ARC I received. Always such a big help in identifying books to keep an eye on! Really looking forward to some of these. I use this to help write some future blog post. I also try and keep my number at 80% so I think it's important to send feedback for everything. My first Buzz Book...super great! Love all the excerpts in one place! Having the covers on hand grabs my attention (which I really dig) and Netzgalley direct is super handy & helpful. It is great to read the list of new titles coming out in the fall/winter and the excerpts of a few. Thank you NetGalley, BuzzBooks is a treat! As always, I love reading Buzz Books! I'm super excited for all these gorgeous fall reads for 2018. Thanks Buzz Books! So glad I actually requested this and read it. Loved reading about upcoming book that I may not have looked twice at on my store. I loved reading the excerpts of all the great books coming out. Almost all are added to my list and a few to my book club list for consideration. This is my first time receiving Buzz Books. I’m so glad I have it! It makes it easier to choose what I want to read and now I can mark my calendar. It’s like having a personal secretary presenting me with books to read. All the research has been done for me. I look forward to each Buzz Book installment; this is no exception. I love seeing what will coming out in the future. I make my list. Added 22 new titles from this Buzz Book issue. What I especially appreciate are the samples from titles I might not otherwise pick up. For example, "The Traveling Cat Chronicles". I read this excerpt one night when I couldn't sleep. It was just enough to captivate and hook me. Now that title is on my list for Fall. Ditto for "Maid: Hard Work, Low Pay, and, a Mother's Will to Survive"  I've got to read the rest of her story. Thank you for these little appetizers of books to come. I'm ready for the main dish! Lots of great excerpts in here. Looking forward to reading quite a few! In particular, looking forward the Silent Patient. This was my first Buzz Books and what an amazing opportunity to read snippets of upcoming books for Fall/Winter 2018. It is broken down into two sections. The first section of Buzz books is a preview that includes the release dates of Fiction and Non-Fiction works. Fictional works are broken down in the following categories; Highly Anticipated, Emerging Voices, Debut, and Commercial. Nonfiction works are dissected into the following categories; Politics and Current events, Social Issues, Science and Technology, History and Crime, Essays, Criticism and More, and Biography and Memoir. Section two allows readers to read excerpts from a range of some of the most anticipated books of 2018. Featured excerpts include "The Travelling Cat Chronicles" by Hiro Arikawa, SarahBird's, "Daughter of a Daughter of a Queen", "Becoming Mrs. Lewis" by New York Times bestselling author Patti Callahan, Diane Chamberlain's, "the Dream Daughter", and Jude Deveraux's, "A Willing Murder." Those are just the first five excerpts to read. The list continues with readings from authors, Lief Enger, Lisa Gabrielle, Stephen Giles, Lynne Hugo and best selling author, Barbara Kingsolver. Sarah Perry's follow up to The Essex Serpent, "Melmoth", is debuted here giving us the feeling of a kid counting down the days until Christmas. Luckily we only have to wait until October for the entire book. There are thrillers, historical fiction and just some really good books that don't need categorizing to wet our appetites. Buzz Books is a blessing and a curse for some many of us bibliophiles. There are so many good books to read and so little time as our book list is growing all the time. Wow! Such a large variety of upcoming books that look very interesting. I’ve added quite a few to my GoodReads list and had friends and followers add them, as well! I look forward to Buzz Books issues to give me an idea of books to anticipate in the coming season and to determine what I might want to read. This Fall/Winter issue is packed with intriguing reads and so much tlent. I can't wait! At first there is a listing of all Fiction and Non-Fiction books for the season - naturally the non-fiction is a small list compared to a huge listing of novels. I already have copies of Dream Daughter by Diane Chamberlain, Melmoth by Sarah Perry, Virgil Wander by Leif Enger, and A Spark of Light by Jodi Picoult that I will be reading soon. I have already read four great books for this season that I can recommend:  Whiskey When We're Dry by John Larison, Ohio by Stephen Markley, The 7 1/2 Deaths of Evelyn Hardcastle by Stuart Turton, and Lies by T. M. Logan. All are really good, but the last two are something special - I loved them both! I see some favorite authors of mine have new offerings and I am anxious to read them all:  Transcription by Kate Atkinson, Love Alive Twenty-Five by Janet Evanovich, The Witch Elm by Tana French, a new John Grisham and a new Liane Moriarty, Blood Communion by Anne Rice, and Elevation by Stephen King. I Cannot Wait!! There were great excerpts of upcoming books that were all really very good. I found the excerpt from The Traveling Cat Chronicles by  Hiro Arikawa absolutely charming and I have requested the full book. Becoming Mrs. Lewis by Patti Callahan looks really interesting and is based on C. S. Lewis' wife. Others I really think I would like are:  Listen to the Marriage by John Jay Osborn, The Air You Breathe by Frances de Pontes Peebles, and John Woman by Walter Mosely. Some debut novels I'd like to try from their excerpts are:  Freefall by Jessica Barry, Family Trust by Kathy Wang, Alligator by Deb Spera, and The Silent Patient by Alex Michaelides, and Little Comfort by Edwin Hill. I'm so excited with this smorgasbord of great offerings! Thank you Publishers Lunch and NetGalley for providing a copy of this book in exchange for an honest review. This is a helpful resource for upcoming books. It is nicely laid out to distinguish between fiction, non-fiction, and debut books. Each book summary contains a preview chapter of the book to give you a sample of the writing. There is also a section for each book about the author which provides information about the author such as any awards or awards they have been nominated for. It also give the applicable publishing information as to pub date, isbn, publisher. Excellent resource! I enjoy watching movie trailers to decide which films to watch and this is the same idea for books. I was pleased with the multitude of exciting choices as well as the generous length of many of the excerpts. I've found several books that I will read based on the Buzz Books list. Love this Fall/Winter preview as it helps aid in creating a TBR list for the cooler months when I do most of my reading. Summaries and sneak peaks help me better decide which titles are must reads. A variety of great stories in all genres -- great way to get a peek at the newest works of your favorite authors, plus find new-to-you authors who match the genre and style which you enjoy reading! Buzz books are great for learning about the new books coming out. I love the sneak peaks and how I can read snippets of the stories from both known and unknown authors. I love it. I will definitely be checking these out more from now on and choosing books from here. It’s much easier. I am so excited for so many of these books! Looking forward to reading them over the fall and winter breaks and seeing which I will be able to incorporate into my curriculum. Amazing compilation as usual of all the noteworthy Fall/Winter releases. Incredibly handy when it comes to planning recommendations and reviews for readers. This was a great way to get a sense of some of the top books coming out soon. I loved being able to read the first chapter or two of each book picked to get a sense of the author's writing style and story! This is a wonderful way to read excerpts from upcoming books. It keeps me up to date and I love being able to get my list of new releases ready. The Travelling Cat Chronicles -  Lets start with the cover! The cover is beautiful. from the light blue background to the bright white cat and fall leaves, it captivated me. It looks like a cozy fall read before you ever open the book. I adore cats, so the idea of a cozy novel told through the eyes of a cat drew me in immediately. I would love to read this novel cover to cover and spend some time in the world of this cat as Arikawa sees it. The Dream Daughter - This cover is insanely beautiful. Not to mention, right there on the cover it says "Diane Chamberlain" I will read literally anything the woman writes. I can hardly wait to get my hands on this one! The Boy at the Keyhole - I am a sucker for a creeper read, which this promises to be. And creepy books about little kids are always creepier. Sign. Me. Up. Listen to the Marriage - This book sounds intriguing. A failing marriage seen through therapy visits. Although, I must say, something about the writing style feels a little... suspect. I can't help but think there is a lot more going on than just a failing marriage and visits to a therapist. I can't wait to see what twists and turns are hiding in this one. Cross Her Heart - Honestly, this is another one where just knowing the author was enough for me. A new Sarah Pinborough novel was all I needed to know that this story will keep me on the edge of my seat gnawing my nails off. The Dinner List - Clearly this reading season is looking to be incredible because I am looking forward to more books than I felt on the fence about. The Dinner List looks magical. Its the classic "who would you have dinner with dead or alive" question answered in a novel. I can't wait to curl up with this on a rainy winter afternoon. Freefall - This debut novel captured me from the first page. This is an author who knows how to convey a sense of urgency. I can't help but thing this will be a book that leaves readers gripping their novel till early hours of the morning because they can't quite set it down. I will absolutely be watching for this one to hit shelves in January. Chariot on the Mountain - The second book featuring slavery that sucked me in was Chariot on the Mountain. This is probably top three in the books I am most excited to see come out. It promises to be very well written, well researched, historical fiction. Witness - Come. On. Someone who interviewed Elie Wisel wrote a book!? This is going to be an amazing inspiring non fiction experience. Seriously, if I took the time to detail every book that is coming out this season that looks incredible, this would be way too long to hold anyone's attention. Those are the books I am the most excited about. Fall/Winter in my experience, has always been the best season for new books and 2018 does not look like it will be disappointing. Happy reading everyone! I love reading these excerpts from publishers. I get to see what they are publishing and I learn about great new reads. This book is full of excerpts for the upcoming winter season. Several new first time authors are included as well as a wider spread of voices like from India and Afghanistan. The excerpts are long enough to get a good feeling of the content and mor important ly the style and voice of the author. This  makes it easy to decide which books Inwould like to read in full length.This Buzz Books  are useful to make informed choices about what to read. Excited to see so many great books coming up this fall and winter! Looking forward to seeing these e-galleys! This book gives you enough excerpts to whet your appetite and that is basically what it did. I am definitely interested in what is coming our way for fall in winter. My favorite reading season! I always love these titles. Thank you for doing them every season. They are so helpful in deciding what to read! Lots of great books on this list! I look forward to these lists all the time and sometimes even go back to older ones to find something I wouldn't usually pick up. Buzz Books 2018: Fall/Winter is a great resource for discovering debut authors and the latest novels from established authors. The compilation offers a great mix of genres and experienced and up and coming authors. If you want to be in the literary know, Buzz Books is your go-to resource. Another great edition from Publishers Lunch. I always find new books to read in these installments,  and the fall/winter edition has me especially looking forward to House of Gold, Daughter of a Daughter of a Queen, 99 Nights in Logar, and The Red Address Book. Thank you Net Galley and Publishers Lunch for providing a digital copy in exchange for an honest review. Such a great resource for librarians! It is so helpful when planning for book clubs. I am the main purchaser for adult books at my library and I love it! I love these samplers. I discover new books that I would never dream of hearing. So many amazing fall and winter releases I can NOT wait to pick up. Loved having this ebook. It was helpful to me because I am a "glutton" re books and always think I can read more than is possible for me. Therefore, this book helps me decide what books are going to be most enjoyable for me. I love Buzz Books. I like seeing the books that will be available in my favorite genres. I like that Buzz Books offers you the opportunity to preview the book to see if it is something you will really enjoy. I love these books! I'm always finding new titles to read and I love reading the excepts! Such a great resource for readers and book professionals. I love Buzz Books to discover new authors that I haven't yet read, or just new reads to add to my TBR! This edition of Buzz Books is the double stuffed oreos of sneaky peeks. From categories with long lists and publishing dates included the reader gets meaty previews in Fiction, Debut and Non-Fiction. Several of the titles I've had the pleasure to review already. Dream Daughter by Diane Chamberlain, Unsheltered by Barbara Kingsolver. In debut there are a few I keep hearing about like The Mermaid and Mrs. Hancock by Imogene Hermes Gowar , 99 Nights in Logar: A Novel by Jamil Jan Kochai and Aligator by Deb Spera. In Nonfiction, one that I am looking forward to Maid: Hard Work, Low Pay, And A Mother's Will To Survive by Stephanie Land. I enjoyed over the summer learning and the new Fall/Winter books for 2018! I always look forward to the Fall/Winter and Spring/Summer Buzz Books! Great options for my Fall/Winter reading. I will definitely pick up several of their recommendations..
Great for previewing upcoming books from your favorite authored or to discover new authors. I like the fact that you get a short excerpt. These Buzz Books previews are very helpful. I love reading about new books, and I get lots of ideas for myself and for my book club! Thanks for sharing these and making it so easy to request books from them. I read them every time and find books to buy as well. I enjoy seeing what is coming up. It helps me to decide what I want to watch out for in the upcoming season. Thank you for providing these guides. I think I would be lost without them. Once again, Buzz Books does it again with compiling a fantastic list of Fall and Winter new releases. I enjoy staying up to date on what is new, and planning my to-read lists for the new year. This has helped me better plan this year. As always, this is a wonderful resource for upcoming titles. I love seeing the books slated to be published. Thank you for the previews! I always enjoy these previews and use them to put together my seasonal reading list. I'm giving this one 4 stars as I didn't find as many intriguing books as the summer version.